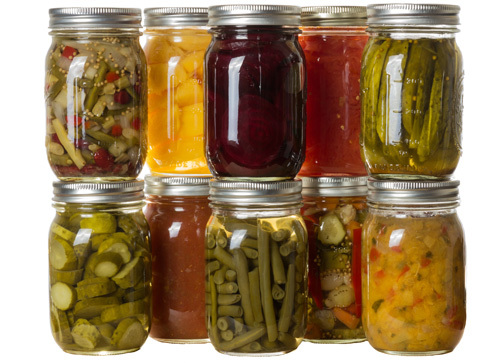 Quantity: An average of 5 pounds of beans is needed per canner load of 7 quarts; an average of 3-1/4 pounds is needed per canner load of 9 pints – an average of 3/4 pounds per quart. Quality: Select mature, dry seeds. Sort out and discard discolored seeds. 2. Sort and wash dry beans. 3. Add 3 cups of water for each cup of dried beans or peas. Boil 2 minutes, remove from heat and soak 1 hour and drain. 1/4 teaspoon each of ground cloves, allspice, mace, and cayenne pepper. 3 cups of cooking liquid from beans. 3/4 teaspoon powdered dry mustard. 5. Fill jars three-fourths full with hot beans. Add a 3/4-inch cube of pork, ham, or bacon to each jar, if desired. 6. Fill jars with heated sauce, leaving 1-inch headspace. 8. process in a pressure canner according to the recommendations. Let cool, undisturbed, 12-24 hours and check for seals.